Oh dear, it is indeed very PINK and as my friends will tell you, I am not very fond of pink. How did this creep up on me? I have been playing with disappearing nine patches, and made quite a few with the fabric left from the Parsley and Time quilt. I selected five and put them on point with pink set - in triangles. Then added a floater and arranged more disappearing nine patches around the centre square. A second floater and then two borders. It was not until I looked at it laying on the spare bed that I thought " Oh my goodness, it is very Pink!" I did intend it for a certain person and on second thoughts, she is not very fond of pink either. Now I must finish it or it will be relegated to the UFO pile. 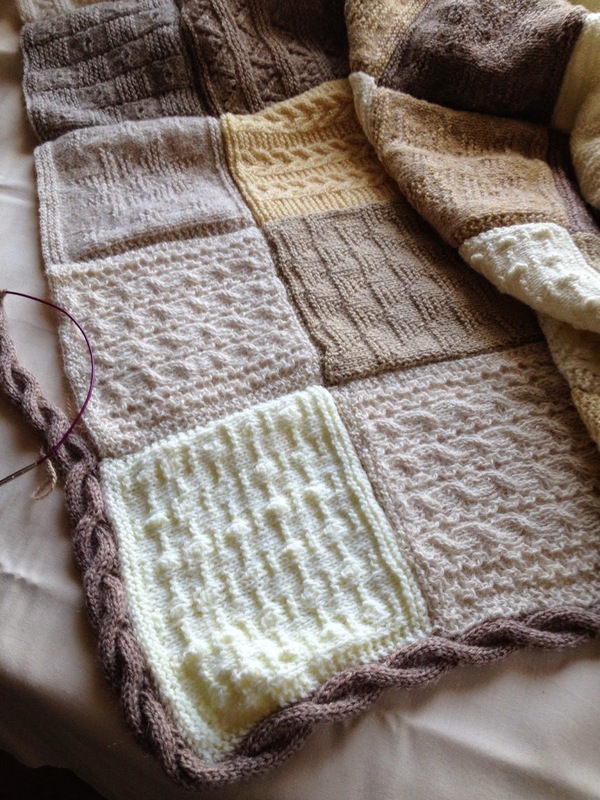 As well as sewing, I have been putting the mystery afghan blanket together and knitting up the rope around the edge, (which seems never ending). This one stayed all off-white, creams and browns. So I intend to make one with the lovely greys that I did not use. I have just finished reading a lovely book called The Forgotten Seamstress by Liz Trenow, and would recommend it to any quilter, it was spellbinding till the end. Now to finish that pesky knitted rope. BOM's Done for this month. 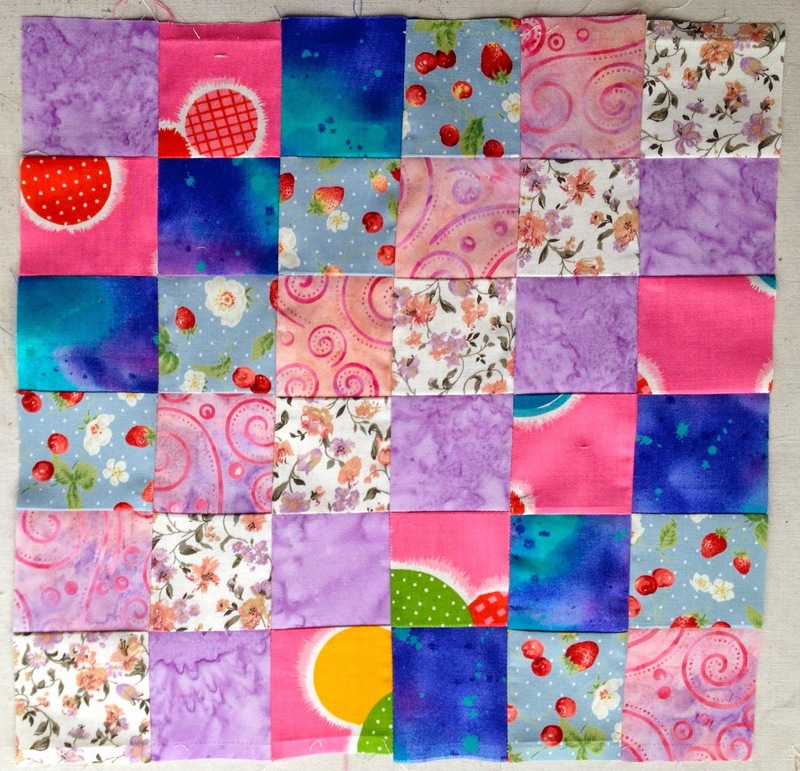 This is block nine of the Floral Impressions Quilt BOM designed by Deborah Kemball, using the lovely Oakshot fabrics. I should have done a little more embroidery but I love it as it is. 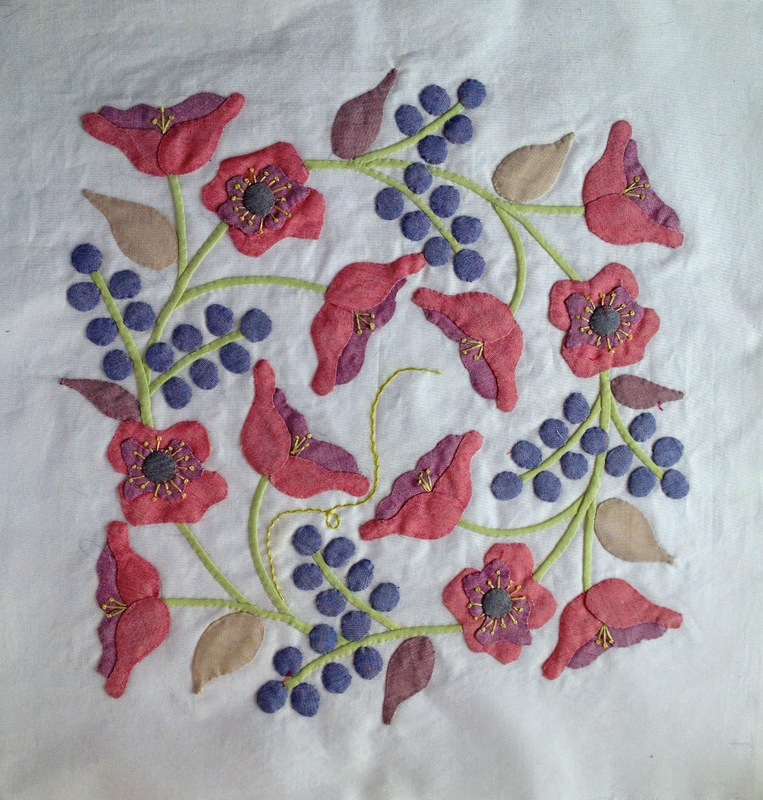 I was really dreading this block, it was definitely a case of OMG with all those little berries and poppies, but I am pleased with it now that it's finished. 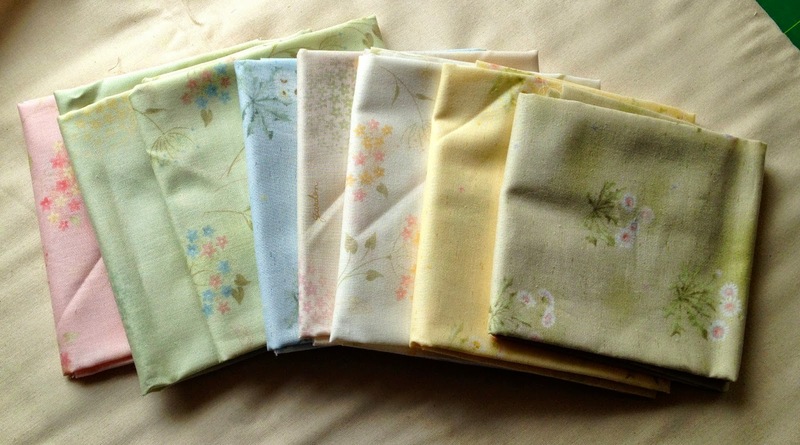 I have another quilt in mind to use up the lovely fabrics left from the Parsley and Time Quilt. However, as usual, I keep changing my mind so it's a case of watch this space. It's time I gave you another view out the back door as the flowers are changing. Some have died off and now the roses are out. this is a view to the side, under a rose arch. Lot of these plants just appear, courtesy of the birds, so we just let them grow. Now this made me laugh this week. 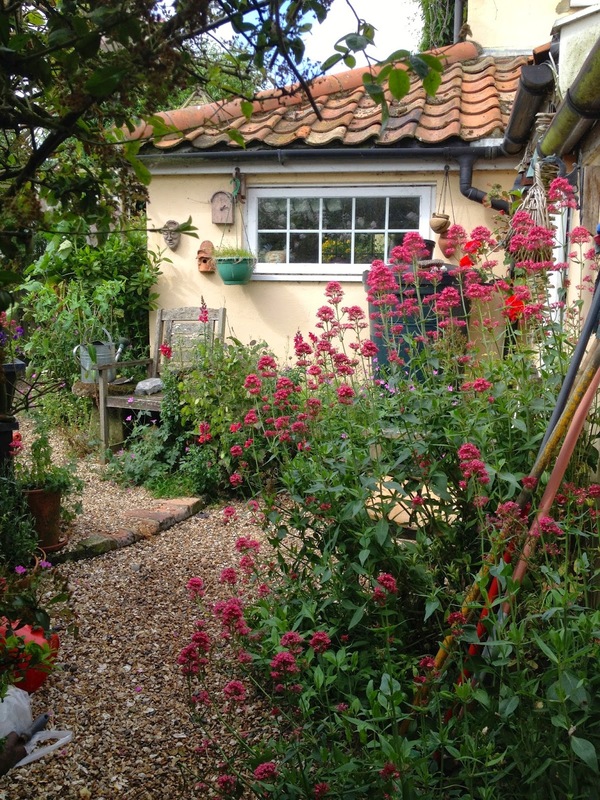 We have a holiday cottage which we rent out to visitors. We have had it for fifteen years and I have never seen this on the bedroom floor till last weekend when we were changing the beds. One friend said it was a Doti Elf and another it was smiling but it looks like a grumpy Gnome to me. Now off to make some definite (?) decisions on this next quilt. I did indeed have a finish at the Bee last week. I finished the binding on The Siblings Together 2 Quilt. Now all it needs is a label. 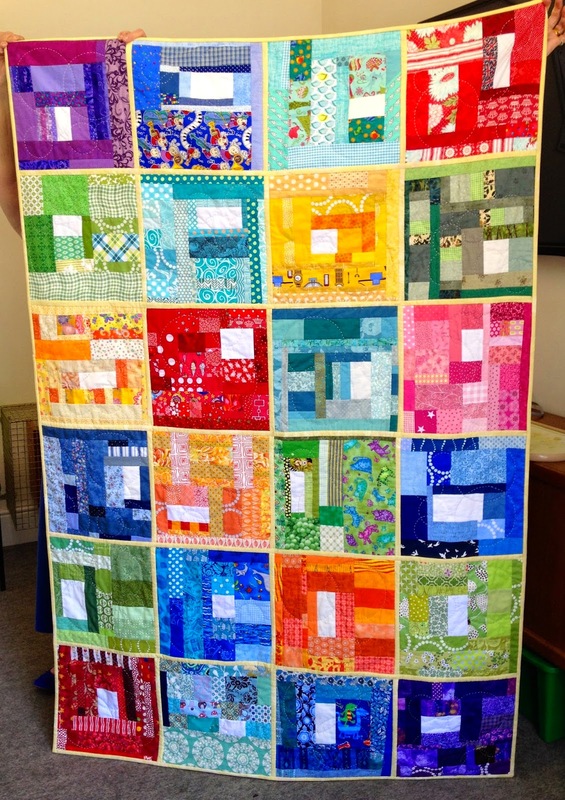 Considering the blocks in this quilt were made by 12 different people, it has come together very nicely and is a bright, cheerful, fun quilt and I love it. I do hope the child who receives it will love it too. 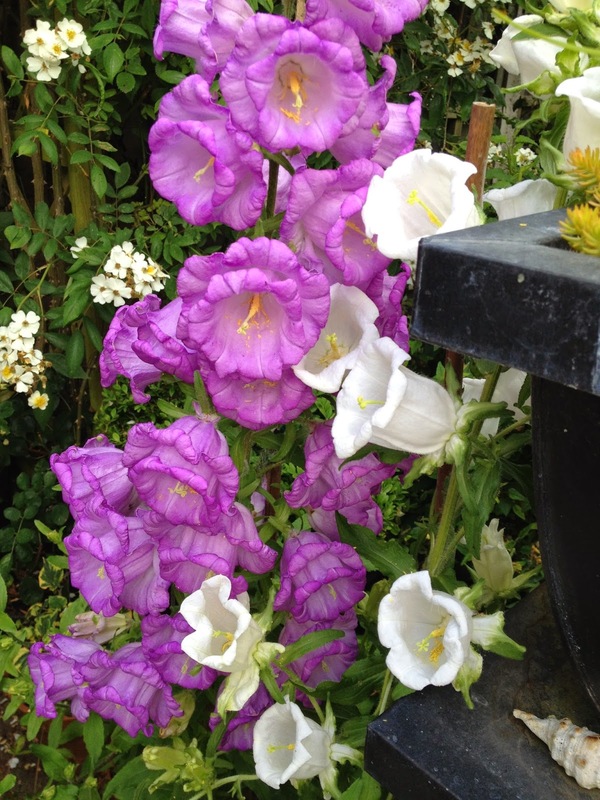 Blocks N,P R & O.
I must show you some of the beautiful Canterbury Bells growing in my garden. These are some of the paler ones and the dark purple ones have been magnificent.The seed for these was bought in Canterbury Cathedral several years ago and I save seeds each year. The next job on my list is to cut out the pieces for The Appliqué BOM. It looks a bit difficult this month, but then they have all looked difficult so best get on with it.. 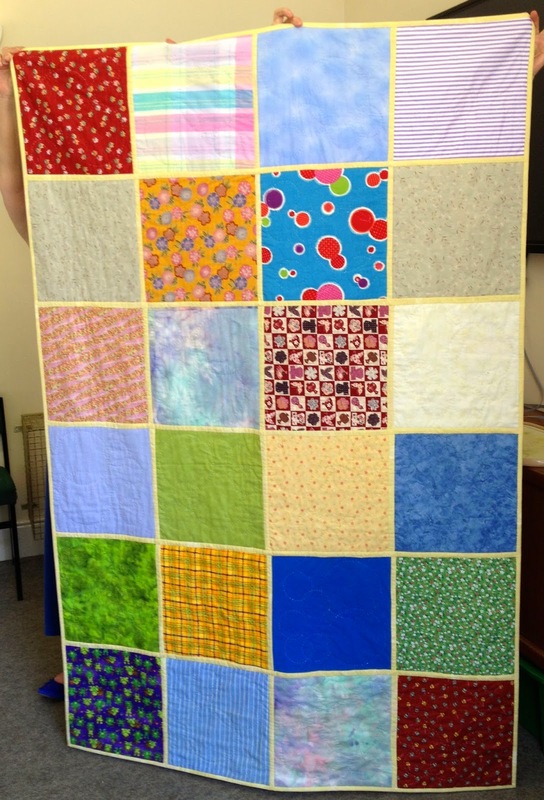 It's a case of prioritising this week, so it is the quilt for the Siblings Together 2 that is top of the list now. Rows 5 & 6 waiting to be added. It needs to be put together in time for the retreat. There are twelve people in our group so that is 24,12 inch blocks. 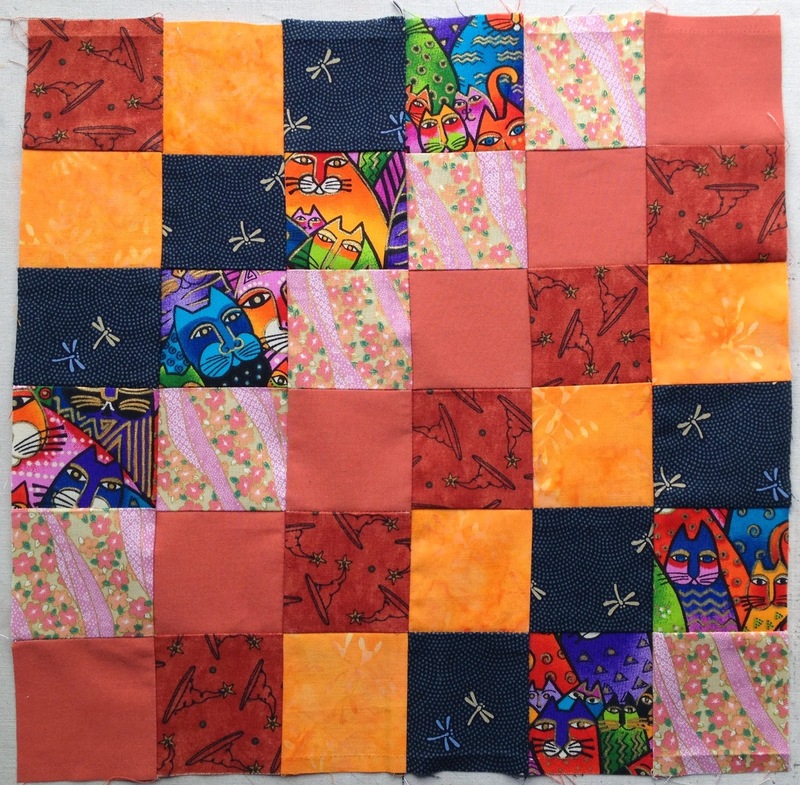 I chose the slab block for my month from Sunday Morning Quilts by Amanda Jean Nyberg. I thought it would be bright and cheery and the blocks from the rest of the group are indeed just that. To day, I hope to add the last two rows, make the binding and attach it. Then it will be ready for me to take to the Bee tomorrow to stitch down. 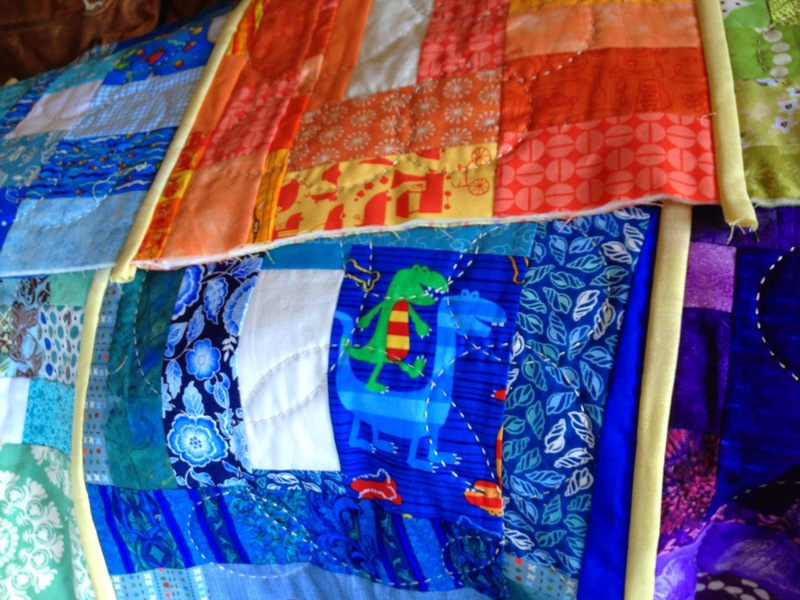 As the blocks arrived from the other members of the group I wadded, backed and quilted them. Teresa is the last Mama of the month and she chose "scrappy trip around the world" blocks. Her blocks were the top of the list, so were posted off to her yesterday. Last week at the Bee we celebrated the finish of Alison's quilt. 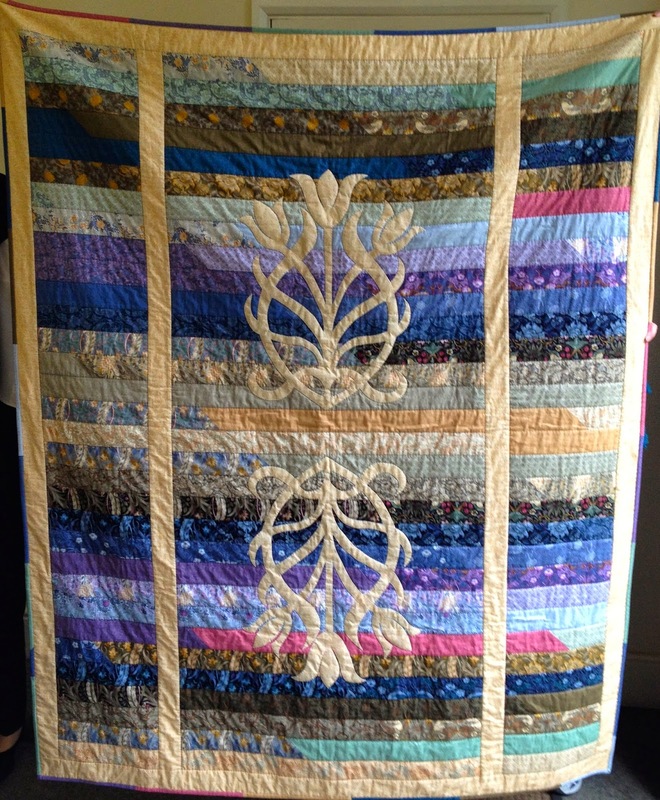 She quilted it all in the ditch by hand. It's very William Morris and just lovely. Got to get back to the sewing machine now, and perhaps I shall have a finish at the Bee tomorrow. The Parsley and Time Quilt is finished. Just the label to do, and I am one happy bunny to say the least. This quilt seems to have taken a very long time, first all the cow parsley stitchery,49 in all. 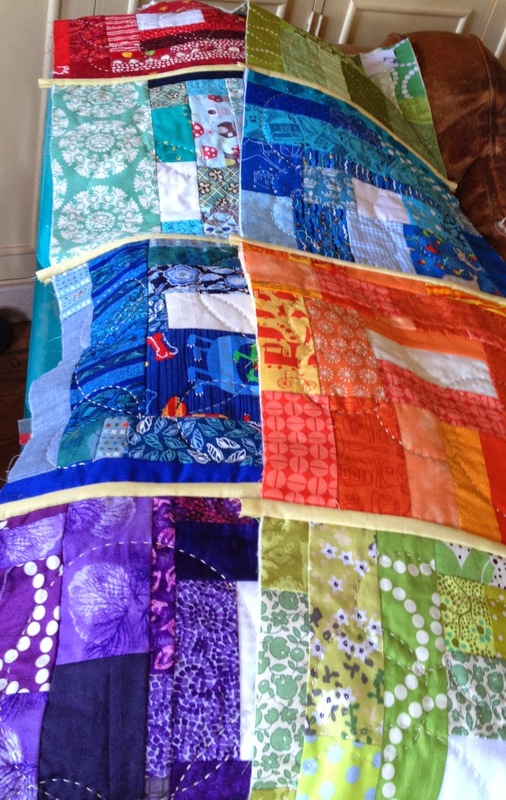 Then I decided to hand quilt it. I do hope I am not boring my readers with so many pictures, but I just love it now its finished !!! Though there is a sad note this week end . The bird who had built her nest in our Rose arbour is OK but a cat ate her baby, last year it was Bilbo our Border Terrier who did the dirty deed. Now next year if she decides to build there we will have to dissuade her, for sure. Got to download this weeks mystery afghan pattern and all the BOM's for June.